2. Date Eligible - This considers the Eligibility Date Criteria selected above and can be used to fine tune eligibility if needed. 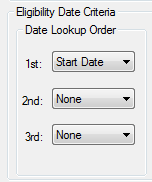 If you want to prohibit manual overriding of the system calculated enroll date, you can change the value of the Eligibility Date Override to "Prohibit", otherwise keep the selection as "Warn"
After all selections are complete, save the benefit and move on to step 4.